This was quite an unusual race night in that not only was there a good wind of 15 to 20 knots (force 4 to 5), but 7 boats were on the water for the race. That is the most I have seen. There were only 6 for the big Harbour Cup race in 2013. I had Lloyd Kelly crewing with me, and it was the first time that we had raced together. It was actually only the second race ever for Serenity in her 9 seasons on the water with me. My racing experience is rather limited on any boat, and Lloyd has not done much more. It was to be a learning experience. It is not really fair to call this a race. It was just 7 boats chasing each other around three buoys, 2 orange and one green. The official yellow buoys have not been put out yet. At the start, there are three orange buoys close together for the clubs moorings, and there was some confusion as to which we had to start from and round. Some boats did not have their radios on, and of the ones that did, some were not on the correct channel, or were having problems with their radio. This led to a couple of the boats starting 10 minutes before the others. I was still raising sails when I noticed sailboats already well down the line to the first mark. We decided to track our own time, but I couldn't get the timer to work on my watch. Might have helped if I had the chance to put on some glasses to see how to use it. My sail plan for the wind conditions was full main and working jib, but Lloyd and I quickly realized that the gusts were going to be too strong for that much sail in the little boat, and we popped a reef into the main. Even with that, we had to often employ a fisherman's reef (the act of quickly releasing the main sheet and letting the sail drop temporarily to leeward) to maintain a heading, and not be forced into rounding up. Michael (Chrysler 22) about to be passed by his father, Mark (Mirage 35). We knew at the beginning that this was not going to be a serious race, so we just set about to make it around the buoys as best we could. Starting well back in last place, there was some ground to make up. Eventually, we fell into somewhat of a rhythm, and mistakes became fewer. We played with the jib sheet runs for better sail shape. The boat began sailing better, and faster. We went from alone at the rear, to up with crowd. By the second lap we even managed to pass a boat, Moon Shadow, a Chrysler 22. On the third lap, however, one of the boats that left early, and the fastest one on the course, a Mirage 35 lapped us. 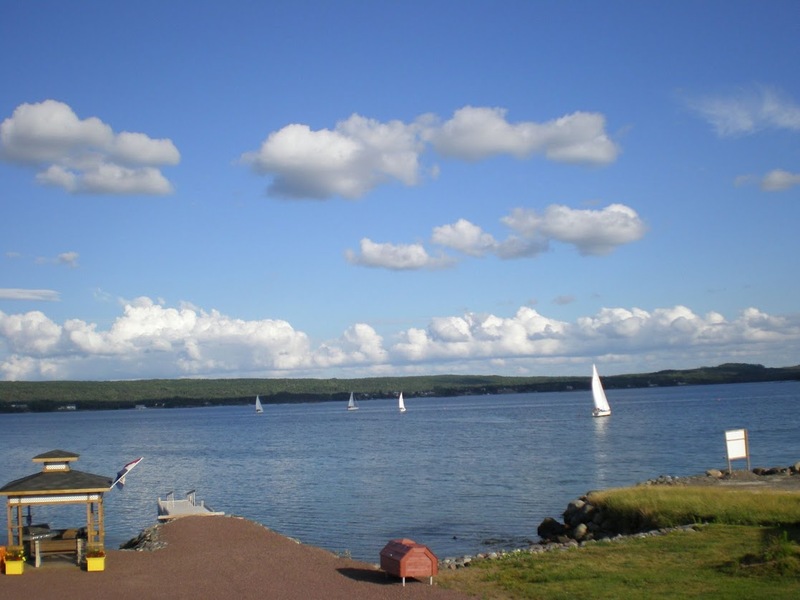 Wednesday, August 6 will be the annual Harbour Cup Race. 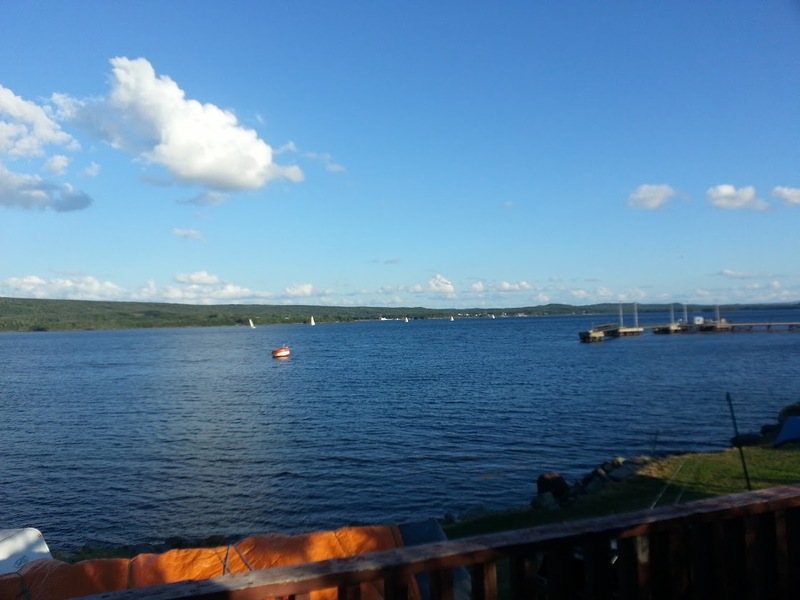 It has been held for the past 3 or 4 years as part of the Lewisporte Mussel Bed Soiree. Tonight's race I consider to be just a training run for that one. It will be a bigger deal, with a committee boat, and hopefully the yellow buoys in the water. Trying to find the correct little orange ball, from across the harbour, while staring directly into the setting sun was not fun. Overall, I'm pleased with how we did. Had all the boats started at the same time, once the handicaps had been applied, I think that we would have done quite well. Catching up to and then passing another boat, of similar class, is quite enjoyable. I think that Lloyd and I make a pretty good team. All the other boats had at least 3 people. I need to find another person to crew. Are you interested?